Influential British designer Phoebe Philo revived the wardrobe of the modern woman when she took the reigns of French fashion house Celine in 2008. Her contemporary minimalism and pared down luxuriance continue to set the trends at fashion week. 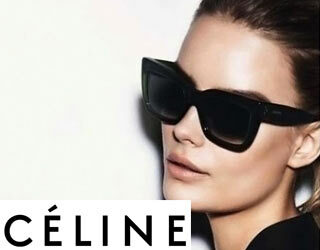 With the same cleanliness, strict colour palette and supreme quality Celine eyewear is as coveted as the clothes. Contemporary takes on timeless vintage shapes are handcrafted in Italy, made of acetate and accented with sleek metal. These frames bring an instant stamp of Celine’s brand of polished cool to any outfit or occasion.